One Marine in each rifle squad will be designated to fly small drones and run some of the Marines' expanding array of other digital devices. With debris scattered for miles across the flat countryside of the Mississippi Delta, federal and local officials combed soybean fields for clues in a military plane crash that killed 15 Marines and a Navy sailor. John Rice graduated from East Chapel Hill High School and went to college but he dropped out to join the Marines Corps. Rice insisted on infantry, and was assigned to a special operations unit that deployed to Iraq in 2008. Three months into his tour, he was injured. He told the story to his wife Cassie at the StoryCorps booth in Durham, North Carolina. Combat Training: Can Female Marines Get The Job Done? NPR — along with seven public radio stations around the country — is chronicling the lives of America's troops where they live. We're calling the project "Back at Base." Lance Cpl. Jasmine Abrego is an office clerk who dreams of becoming a warrior. She's flat on her stomach in the dirt, in full combat gear. Suddenly she pops up, slings a 44-pound metal tripod on her back and lurches forward in a crablike run. Finally, she slams the tripod to the ground. A male Marine slaps a .50-caliber machine gun into place. Sgt. Kristy Rodriguez is sprinting on a treadmill. She's wearing dark green shorts, a matching T-shirt and white sneakers. The pace keeps getting faster. Rodriguez is at Camp Lejeune in North Carolina, taking part in a Marine Corps experiment to determine whether women will be allowed to serve in ground combat units. "A lot of people think that we can't do it," she says. "I don't think the same." As she runs, Rodriguez stares at a photo — the iconic shot of Marines planting the American flag at Iwo Jima. A career fair gets underway this morning in Raleigh that’s not for your the average job-seeker. It’s specifically for men and women who were injured in the line of duty. They’re called “Wounded Warriors” and in these tough economic times, there’s a special push to get this group back to work. Whatever the unemployment rate – it’s usually twice as high for veterans. Vice Admiral David Dunaway doesn’t like that statistic. For more than three decades, hundreds of thousands of people were likely exposed to contaminated water at Camp Lejeune, a Marine base in Jacksonville, North Carolina. Women are still excluded from certain areas of military service, but the Department of Defense has given branches until 2016 to eliminate "unnecessary gender-based barriers to service". 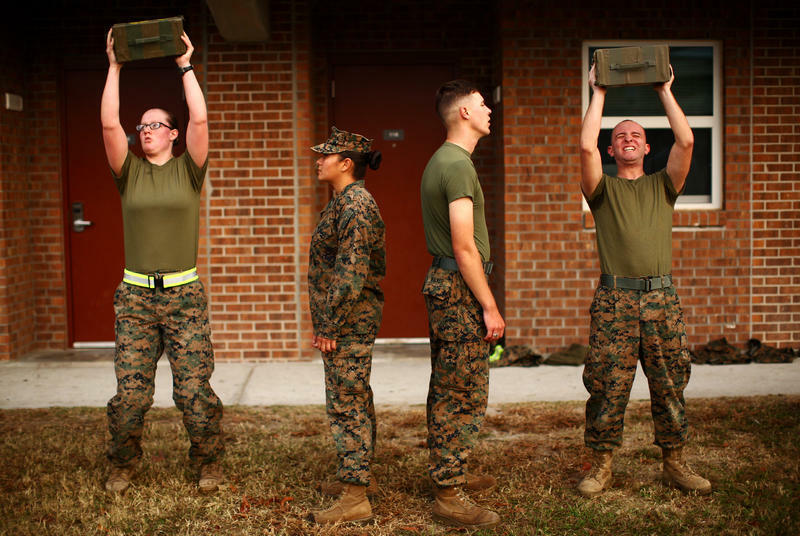 Now, bases are evaluating how women fare during training that was reserved for men. 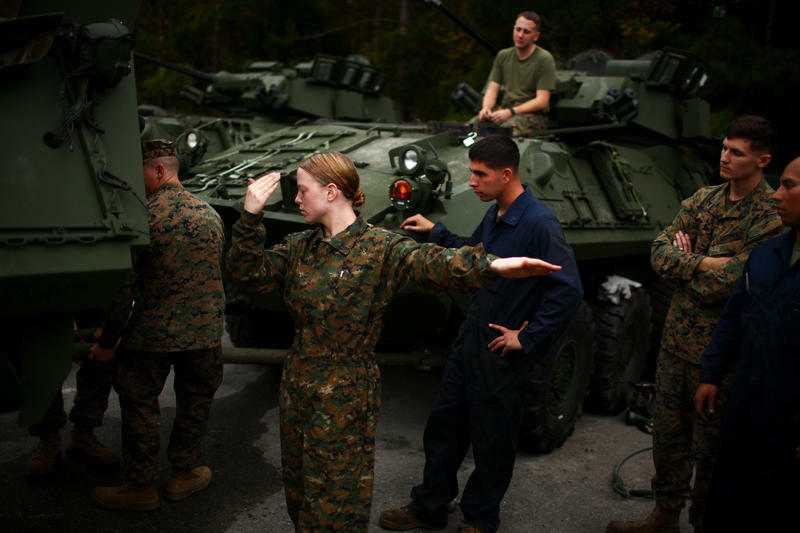 Camp Lejeune is studying enlisted female Marines who have passed their first 29 days of general training and volunteer for another 30 days of specialized training. At the end of it, their male peers can become machine gunners and missile men. Why Does WUNC Pronounce 'Camp Lejeune' With An 'R'? Camp Lejeune is one of the Marine's largest bases. Here at WUNC, we report on the base regularly because it's located in North Carolina. We used to call it Camp "Luh-JOON". But we recently started pronouncing it "Luh-JERN". How come? A Camp Lejeune Marine receives the Silver Star Tuesday for his actions of valor in Afghanistan. Staff Sgt. Daniel Ridgeway will the get the award during a ceremony on the base. Ridgeway says he and his men were walking in line toward a stockpile of enemy weapons, which they had been ordered to clear out, when a blast knocked him over. "My teammate ended up stepping on an IED," Ridgeway says. The U.S. Marine Corps remained segregated until 1948. The first group to break the color barrier was a group of African-American men who trained at Camp Lejeune in Jacksonville, NC. They became known as the Montford Point Marines. Earlier this summer, the Montford Point Marines were awarded the Congressional Gold Medal in Washington, DC. FM Hooper was among the men who were honored at the ceremony. A U.S. Senate committee has heard testimony about the Marine Corps' attempt to delete information from a government report on contaminated drinking water at Camp Lejeune.